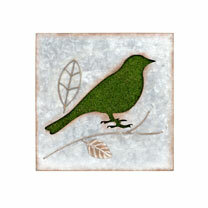 A combination of distressed and edged galvanised steel with green grass effect flocking. With neutral tones and a classic design, this decorative wall piece is sure to enhance any indoor and outdoor wall or fence. Bird 30 x 30 3cm. Wall fixings not included.